What we read when we're young has such an impact. What were three of your favorite books as a child? While I always loved devouring picture books as a child, I also really loved comic strips and found they are what really began my love of storytelling through visuals and words. So to switch it up, here are my top 3 childhood comic strip books. 3. Charlie Brown books (and The Far Side, once I was old enough to understand them). What inspired you to pursue a career in illustration? How old were you when you knew it was what you wanted to do? I can't say for certain what initially inspired me to pursue illustration as a career. I grew up soaking in all types of art/stories/animation and think it muse have been true love at first sight. :) From a very young age I knew I wanted to be an artist in some capacity. I had always loved trying to make my own stories, be it though comics, comic strips or picture books. You can read about my whole journey here. What do you wish you had known about this creative career path when you were first starting out, any words of encouragement for budding illustrators/writers/animators? Don't get too caught up in comparing yourself to others. Do your thing, put in the time/effort and always remember to have fun! We are so excited to read your latest solo project 'Where Oliver Fits' when it comes out this fall. What was the inspiration behind this story and character? What do you hope young readers take away from it? Thank you! I'm super excited for everyone to meet Oliver! Like most of my stories, the inspiration for Oliver stemmed from my own experiences and feelings. In our lives, fitting in is such a major part of who we are and how we feel. It truly is the search for where you as a piece fit in this big ol' puzzle called life! Drawing from the times I've tried fitting in the wrong spots, changing myself to fit and finally realizing, if I'm not being me, than I'm not really in the right spot. I hope readers take away the message that finding where you fit can be hard, but if you just be yourself then your fit will surely find you. What can you tell us about your upcoming picture book projects? I've got a couple exciting projects on the release schedule! 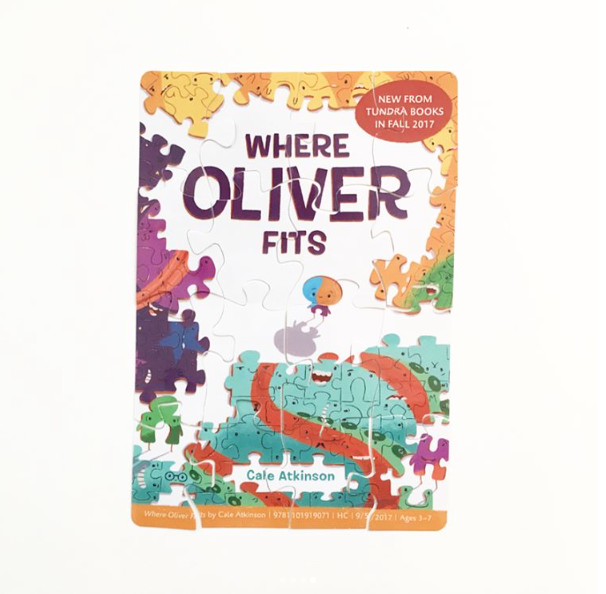 September 5th Our puzzle piece finds his fit in 'Where Oliver Fits' with Tundra Books. Otherwise I'm busily working away on some exciting projects to look out for in 2018! Woo hoo!